Honorary Life Members: David Shackleton, David J. Emmott, John B. Smith, J. Graham Hodgson, Bryan Tunney, John Pollard, Kim Pollard & Phillip N. Akrigg. Before the season began an unseemly fracas at the Wine & Cheese / Quiz night caused a festering resentment, which pervaded the atmosphere in the 1st XI dressing room. The 2016 season was always expected to be a difficult one for our 1st XI following the emigration of Jon Best to Jersey & Neil Spragg’s early retirement. The committee were disappointed with last year’s overseas player and had resolved to manage without…unless the services of a ‘proven’ talent became available. No overseas player and loss of experienced players left a huge ‘hole’ in the side for inexperienced skipper Stephen Pearson in only his 2nd season as captain. It was hoped new-comer James Tincknell could help fill the ‘hole’, but he only managed 5 matches. Bad feeling in the dressing room & a run of poor results meant commitment was not 100%. An unsettled side meant that the results did not improve and our 1st XI finished bottom of the division & were relegated to the 2nd division, ending a run of 6 years in the top flight. The team notched 2 centuries: Freddie Pearson scored 106* not out in the home Waddilove cup against Ben Rhydding & John Akrigg scored 102* not out at Kirkstall Educational. With an average of just under 28 and top score of 102*, John Akrigg won the Club’s 1st XI batting award. With 39 wickets at an average of 25, James Emmott won Club’s 1st XI bowling award for the 2nd successive season. Steve Pearson was again a worthy recipient of the Club’s 1st XI fielding award with 14 catches. In the Waddilove cup Steeton beat Ben Rhydding in the first round, but lost in the 2nd round to Beckwithshaw. It is now hoped that a couple of seasons in a slightly less competitive league may mean that Steeton can bring through some of its crop of promising juniors, before bursting back into the top-flight with a good team of home-grown talent. Last year’s 2nd XI captain Craig Walton was called up as 1st XI vice-captain and Paul Hardwick started the season as 2nd XI skipper. After a mere 5 matches Paul was also called up for 1st XI duty and he was replaced by his young vice-captain, Luke Watson. After 6 matches in charge Luke opted to stand aside an let the experienced Gary Boulton captain for the remainder of the season. Not the makings of a settled side! The league form was poor, and a struggling 1st XI meant that in-form 2nd XI players were frequently called-up for 1st XI duty. The 2nd XI struggled for any sort of results and were looking odds-on for demotion at the mid-point of the season. In the latter stages of the season results started to turn our way an Steeton finished a comfortable 8th place in the top division. Having won the Birtwhistle Cup in 2015, Steeton crashed out ignominiously in the 1st round at the hands of Ben Rhydding. Last season our 2nd XI recorded a 7 centuries, but coming into the final match of the season the top score has Phil Barrett’s 83* in a 1-run defeat.This was to change in the last fixture of the season when 13-year-old Will Luxton scored a quite sensational 154* not out against Guiseley. Will Luxton has a huge future in cricket. With 4 of last year’s centuries it was Will’s father Chris Luxton, who was expected to blaze a trail this year, but Chris’s top score this season was a mere 46 runs, but with a average of just under 24 it was enough to win the Club’s batting award. Bowling-wise Paul Hardwick took 7-11 at Horsforth & Luke Watson took 7-35 at home against Horsforth, but both ended the season playing in the 1st XI. Callum Lowe started the season in the 3rd XI, but he soon became a mainstay of the 2nd XI bowling attack. With 38 wickets (as well as a further 6 wickets in the 3rd XI) at an average of 15, Callum was a worthy recipient of the Club’s bowling award. Adil Modak was awarded the 2nd XI Club fielding award with 6 fielding points & 3 catches. Our 3rd XI was again captained by Hayden Tennant, who once again did a fantastic job for the Club bringing on our young talent into open-age cricket. With 10 wins, Steeton finished in 1st place in the West Conference, and were crowned champions after narrowly beating Rawdon in the play-off. Only the 2nd time that Steeton had been champions and a glimmer of glory in a difficult season for the senior teams. Steeton were unable to replicate their Chappell Cup heroics from last year and lost in a bowl-out to Knaresborough in the 2nd round having dispatched Menston in the 1st round. Steeton 3rd XI recorded 3 centuries: 13-year-old Will Luxton scored 125* in the Chappell Cup against Menston, Hayden Tennant scored 115 against Green Lane & Michael Wilson scored 102 against Olicanian. Youngster Will Luxton narrowly pipped skipper Hayden Tennant to the Club’s 3rd XI batting prize with an average of just under 30; Hayden however took 21 wickets with a average of 7.3 to win the Club’s 3rd XI bowling award narrowly beating Mark Pennington. However Mark was awarded the 3rd XI Club fielding award with 11 catches. Hayden took 4 wickets in 4 deliveries to end on match…followed by a 5th consecutive wicket from his first delivery in the following match. Our U17s came top of the South Conference..and finished a creditable 3rd place in the merit league. Adil Modak was 7th & Bradley Akrigg 10th in the league batting averages. Owen Narey took 9 league wickets & finished 9th in the league. Steeton lost in the semi-final of the William Spencer cup to eventual winners Oxenhope. Our U13s had a good season finishing 4th in the league. James Nelson finished 7th in league batting with Jack Luxton 10th. Max Hibbert finished 4th in the league keeping awards. Another good cup run was ended in the semi-final stage of John Hindle Cup, losing to eventual winners Oakworth. Our U11s finished in a creditable mid-table 9th place in their league. With 151 runs Max Hibbert finished in 6th place in the league batting averages with Luke Spragg 8th, Wilf Roberts 11th & Rhys Troake 12th. Max Hibbert came 2nd in the league wicket-keeping award. Steeton unfortunately narrowly lost in the first round of the Barritt-Stephenson cup. 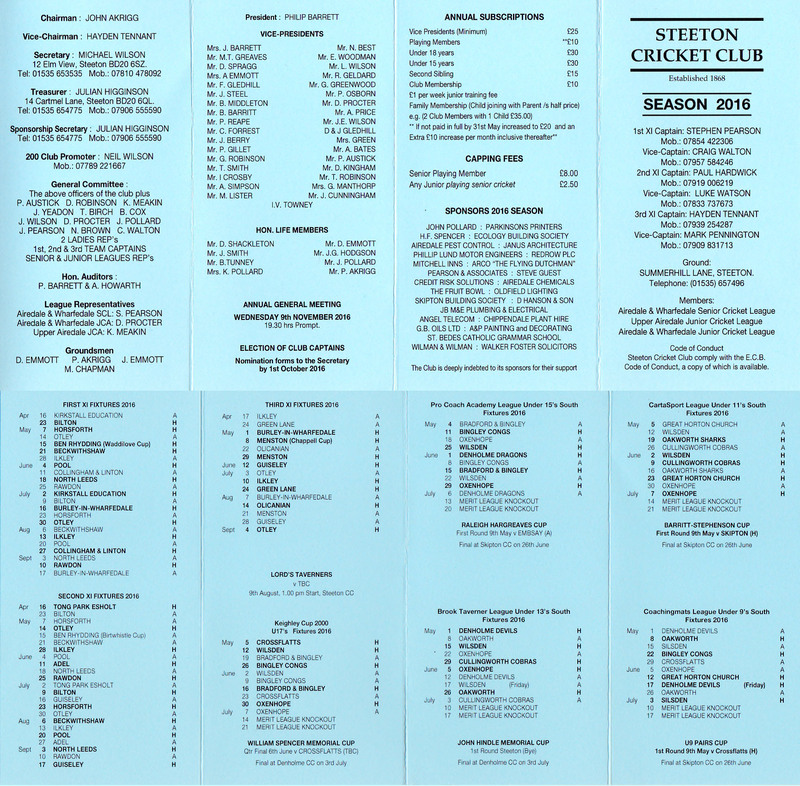 This year saw Steeton CC host what they hope will become an annual Beer Festival. The year ended with the 5th annual ‘adult’ pantomime – a risqué re-telling of the story of Robin Hood returning from the crusades entitled ‘Robin and his Hood’ organised by Julian Higginson. Congratulations to all the participants.